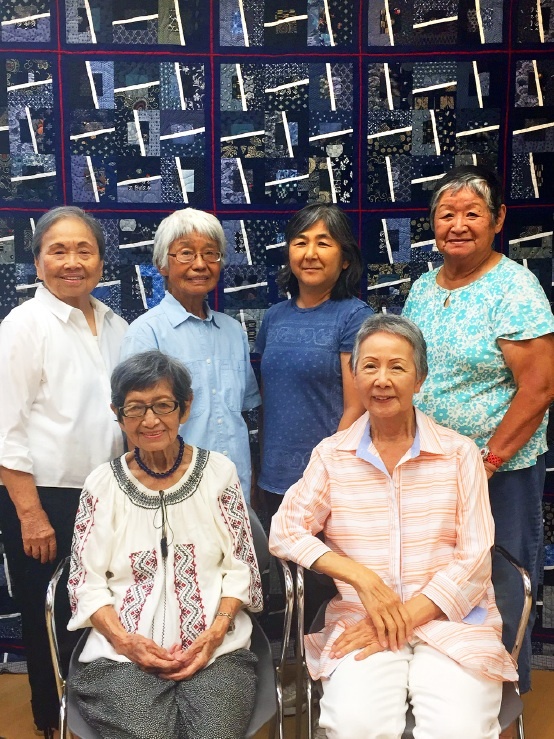 The Little Tokyo Branch Library Quilters with the “Asian Modan” quilt. This year’s Little Tokyo Library Quilt Show will be held Saturday, Aug. 18, from noon to 4 p.m. at Union Church, 401 E. Third St., with free parking during the show. Many beautiful quilts created by the Little Tokyo Branch Library Quilters will be displayed, and a large assortment of Asian boutique items, clothing, and fabrics will be for sale at bargain prices. Appliqued T-shirts, tote bags, decorative magnets, pot holders, and other unique craft items suitable for gifts are among the offerings. Come early for best selections. The queen-sized “Asian Modan (modern)” raffle quilt with striking hues of navy blue fabrics and red accents will be on display. Raffle tickets can be purchased at the show for $2 each, six for $10, or 15 for $20, or from any Quilters and LTBL board members. This year, in addition to the raffle quilt, a lap quilt and wall hanging will be awarded to second- and third-place winners. The drawing will be held at the Oct. 6 board meeting and winners will be notified. All proceeds from the raffle tickets and Quilt Show will go toward supporting the Little Tokyo Branch Library’s collections, equipment, and community outreach programs. The Quilters meet on the second Friday and the last Saturday of each month from 10 to 11:30 a.m. at the library, located on Los Angeles and Second streets. Members work on the raffle quilt throughout the year, exchange quilting ideas, and share their latest creations as they enjoy the camaraderie of fellow quilters. For more information about the Quilters or the show, call (323) 303-7283.